The beginning of this week began like it always does...busy, busy...sometimes I feel the email Gods know I needed a diversion in the midst of an honest to God case of the Mondays. Especially when something as beautiful as this comes in my inbox. 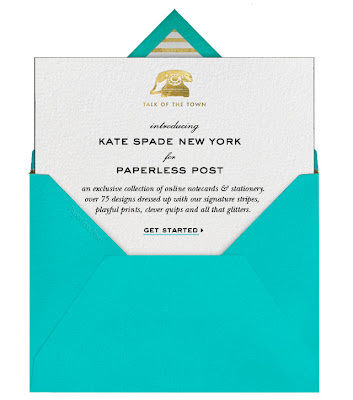 A little hard to see without clicking on but I think you can see the takeaway...kate spade new york for Paperless Post. I think I spit my coffee in a grandios fashion. Here again, my two worlds have collided. If you don't know what Paperless Post is, in a couple of words Paperless Post is like the beautiful, sophisticated New York cousin of Evite. The most gorgeous electronic invitations are found on this site and now I am sure with this partnership the world will now know what I tried to keep as a secret tool in my arsenal. The official announcement is that Paperless Post teamed up with kate spade new york to create a smart new line of 75 colorful cards. 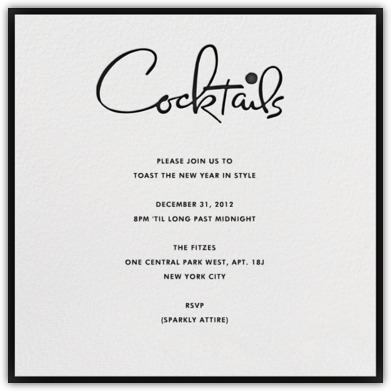 kate spade new york is one of my favorite designers and I am so excited! To kick off their line, they are giving away a grand gift set to make your holidays a bit more merry: a $2,500 gift card to kate spade new york and custom stationery and a professional photo shoot. Click here to enter to win and after you do that click here to see their gorgeous invites, announcements and cards. I had a hard time to pick one that I wanted to feature but I think this invite really shows the clean line and coolness that kate spade is known for.